Cinderella is a 2015 American romantic fantasy film directed by Kenneth Branagh, from a screenplay written by Chris Weitz. Produced by David Barron, Simon Kinberg and Allison Shearmur for Walt Disney Pictures, the story is inspired by Charles Perrault‘seponymous fairy tale, as well as a live-action re-imagining of Walt Disney‘s 1950 animated musical film of the same name. As Disney takes another foray into the live action re-imaginings of their animated classics, Cinderella steps up to take her place. As one of the most iconic Disney princess’ it was little wonder that Cinderella would be amongst the first and with Belle and Mulan to make their selves known in the coming years, Cinderella has to set the precedent of what to expect from a live-action princess film. Now, I won’t go into the story all that much, we all know it. This version expands on the earlier animated version by fleshing out the mother and father figures and just why Lady Tremaine is in (Cinder)Ella’s life. It still features mice that can – somewhat – talk, but has the inclusion of lizards and Mr. Goose. Geese and butterflies are very symbolic in this film with geese representing confidence, protection and determination which Ella has to have in spades to continue after losing her parents. Butterflies are important as they symbolise transition and elegance amongst many others, this is also relevant to Ella as she grows as a person even at her darkest thoughts, her father’s gifts and mother’s words come back and inspire her. Lily James plays our Princess, and she manages to look timid yet strong throughout. I applaud her for managing to breathe in some of the beautiful dresses she had to wear. All though her features are strong and some girls may be unable to relate to her as much as is possible with the animation, James does a sterling job. Richard Madden is our Prince Charming, and with the blue eyes and smile on his face, he is both bashful and strong. Meeting Ella in the forest is little issue for someone who wears tights all the time. Helena Bonham Carter is our Fairy Godmother, and I’m sure I wasn’t the only one just a bit jealous! Who wouldn’t want Helena as their Godmother? Helena plays the ditzy but wonderfully kind godmother and there isn’t an ounce of evil in her. Her dress too it all light and sparkly, two minutes while I write a letter of appreciation to the costume department. Cate Blanchett is our excessively extravagant evil stepmother. Her background is fleshed out more than in the animated version and Cate keeps on the evil mask and keen eye to something not right. Sophie McShera and Holliday Grainger are eccentric and spoiled daughters of Lady Tremaine’s and keep a cool arrogance while bullying Ella. They help provide some comic relief and although not ugly on the outside, inside they are very murky. 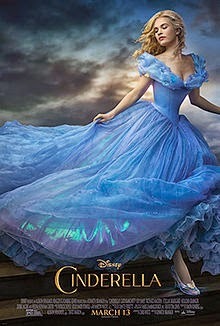 The world setting and costume design is bright and elegant. The colours are very vivid and seem very real in the terms of setting. My only issue with the film is the camera. When there are cases of background to foreground focusing the whole screen would squeeze in the middle and can be a bit distracting for the next few seconds. Some final words? Tights. Tights. Tights.